The memo board dimensions are 13 in. x 13 in. Each memo board has coordinating button detail and decorative ribbon so that you can insert photos, notes, and memos. Metal Hangers on Back for easy hanging. No Assembly Needed. 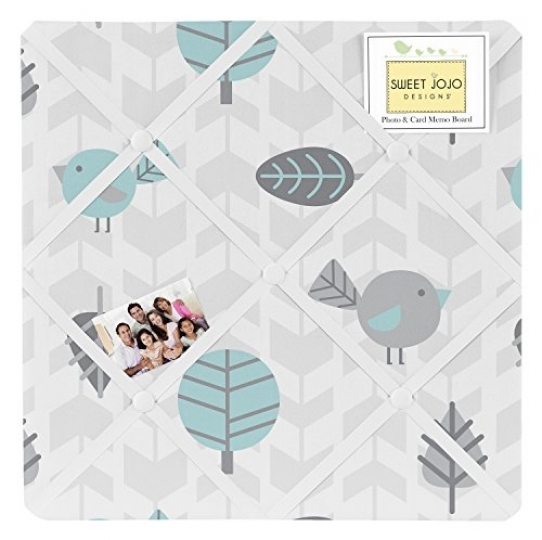 Show off postcards, notes and photos on this fabric memo board with button detail. Just slip your mementos behind the decorative ribbon to create an engaging piece of original wall art. These adorable memo boards have been created to coordinate with the matching children's bedding sets. Even if you have not purchased a bedding set, these wonderful wall decorations can enhance the decor of any room. Note: Pushpins cannot be used with this memo board. It is designed with decorative ribbon to slip your mementos behind.